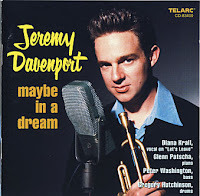 Davenport is a trumpeter and crooner. His voice is soft, understated, and conversational. He's a darn good trumpeter and the trumpet interludes keep things from getting sappy. He's backed by the solid, swinging musicianship of Glenn Patscha, piano, Peter Washington, bass, and Gregory Hutchinson, drums. On "Let's Leave," Davenport's vocals are barely distinguishable from those of guest, Diana Krall. The tunes are mostly in a slow to mid-tempo range. The promo for this release likens Davenport's appeal to that of a young Frank Sinatra. And his good looks are used to advance that appeal with no less than ten different photographs of the boyish Davenport included in the liner notes. Diana Krall - vocal on "Let's Leave"